If I have one problem with SxSW it would be the noise this event generates. From weeks to months in advance people start chatting it up on where to go, what to do, how to survive, … and by the team SxSW is on there is so much live coverage it is hard to find the good stuff. That is until you stumble on coverage like this. 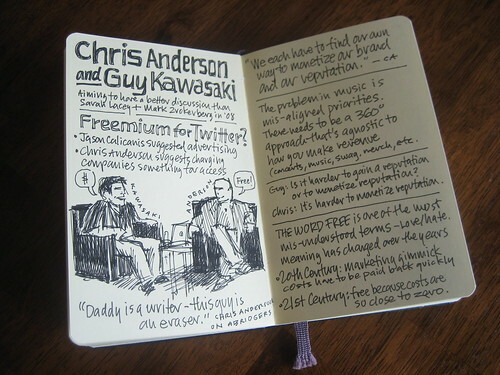 Forget about live blogging, live twittering… here is Mike Rohde live sketchnoting the festival. In a time where speed and quantity seem to drive the online conversation, in a time where it seems to matter more to say a lot and to say it before anyone else… this is just the break you need. Thanks Mike! Agree on this one… talent and good storytelling will always rule. I’m glad that this comment thread stretched a little more because immediacy is a theme that is quite deep and occupied me on many levels from a few countries including a call from the UK by a good friend who didn’t know it was 3am Asia time and I was too polite to mention. The point is that without Mike dropping by I’d have left it but it resonates more when the theme is reinforced so I’ll just say that controlling immediacy is massively important or we could pretty much exist and expire almost side by side if we take this thinking to its logical conclusion. I’d rather note this point at the rightful place in the comments than on my blog because actually this is what I love so much about the connections.